The ATC2, K-type, pipe clamp thermocouple is used to take temperatures of pipes or any other cylindrical surface within its 2-3/8” jaw range. 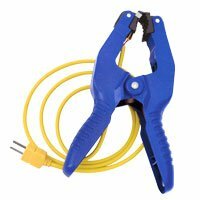 Using a pipe clamp thermocouple greatly facilitates taking superheat or subcooling measurements. 68 TruReward$ points will be placed in your account when you buy this item.